That's very cool, it's like a journey through time. Especially fun since I rewatched An Unearthly Child today. Aside from a missing hyphen, this is pretty much correct. Here's an online tool which will give you your local horizon: suncurves.com. Very useful if you live in an area with some terrain and do astronomy. Wow... sometimes people in Norway/Sweden/Finland can't see the sun for the entire day! Fun random fact I found with SE: There are only two star systems where you can make a journey to from the Sun during which at every moment either the Sun or your destination is the brightest object in the sky. (so no third star ever eclipses both of them in brightness) Those two are Alpha Centauri and Sirius. For every other star, Sirius is brighter than both the Sun and your destination at some point in the journey. Even for Alpha Centauri it's close; at the point where Alpha Centauri becomes brighter than the Sun, both of them are only barely ahead of Sirius in brightness. There is at least one point in space where the apparent magnitudes of all three are equal. I wonder what the shape of the region for which this is true looks like. We took the kids for skiing today. Suddenly the tranquility of the forest was broken by an odd noise. Like someone were welding something just next to me. The I realised then that we just passed some high voltage power lines. So I skied a bit back and saw this 20m pillar of fire in the woods. The weirdest sight I've seen in a while. So I skied a bit back and saw this 20m pillar of fire in the woods. The weirdest sight I've seen in a while. The I realised then that we just passed some high voltage power lines. 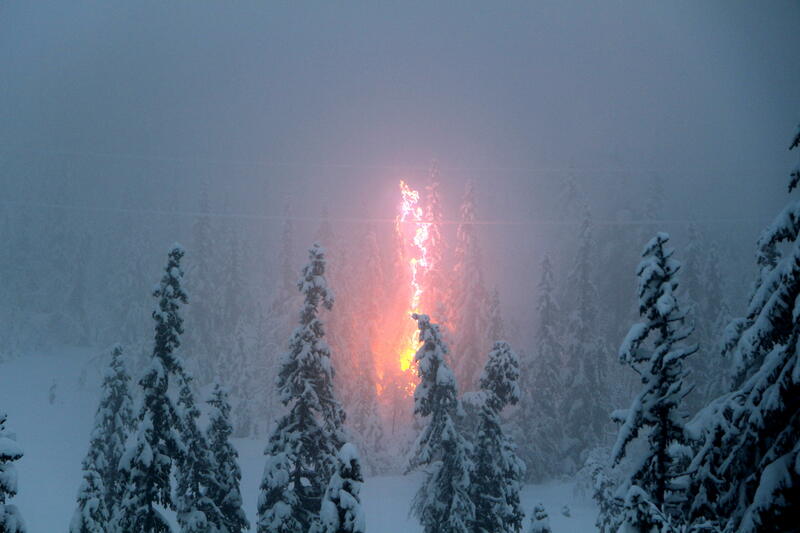 So I skied a bit back and saw this 20m pillar of fire in the woods. The weirdest sight I've seen in a while. Wow, that's one hell of a discharge. Simultaneously scary and awesome.